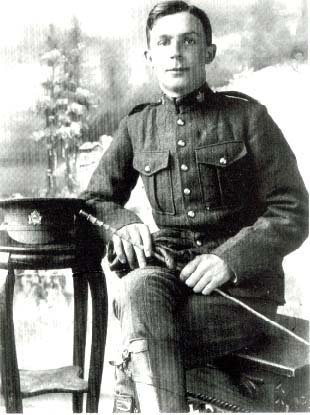 Uncle Alg Purchase of Winnipeg was the first to take to the air during World War 1. He was at the Manitoba Agriculture College and joined the University overseas unit, went to France, but volunteered for the new Naval Flying Service in 1918 and flew blimps on patrol of England's coasts. Below he is seen visiting his admiring relatives in England, in 1918. The admiring family at Moreton, Dorset. A view from the blimp SSZ37 with a box camera! Her trials were April 2nd 1918, on anti-submarine patrol of the British coasts. 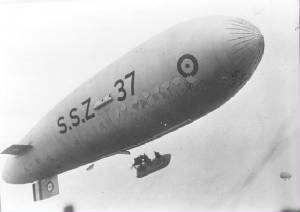 She had a forced landing on the Mumbles, near Swansea on August 18th, the blimp deflated, but the crew unhurt. The aluminum and ash car enabled it to land on water if required. In November the blmp took part in towing tests behind a destroyer. The blimp logged 675 hours before being deflated in January 1919, and was deleted from service in October of tht year. Here is uncle Alg Purchase in England in 1918 on a demonstration of bombing foe King George V (looking through binoculars). Alg Purchase is the tall officer on the plank on the right.